Hi guys, see me again about the world of information technology. The more sophisticated a technology, the more problems faced in the world of technicians. This time I will discuss how to service a laptop, according to the theme above I will divide the damage into 2. A. Troubleshoot laptop hardware damage is totally dead. Problem description: When you plug the AC adapter into a laptop, there are no lights on at all. When you press the power button, no reaction occurs. The laptop seems completely dead, no sound, no indication of life. The AC adapter fails and the battery runs out completely. First of all, test the AC adapter. If it is dead, replace the adapter. DC jack is detached from the motherboard (or DC jack is damaged) and the laptop does not obtain electrical power from the AC adapter. In this case, the DC jack must be replaced. Laptop motherboard is damaged. If that happens, chances are that laptop hardware damage is not worth repairing. B. Problems with hardware failure Laptop turns on but the screen is blank. Problem description: the laptop turns on, the LED light on the laptop turns on, the fan cooling works but nothing appears on the screen. The screen is completely black and empty. There are no pictures on the screen at all, even very dim images also do not exist. This laptop hardware damage problem can be associated with memory failure. Maybe the memory module failed and the laptop did not turn on because of that. In this case, you can try resetting the memory module to ensure good contact with the slot. You can try removing the memory module one by one and testing the laptop with only one memory module installed. You can try replacing the memory module with a new module. If reset / replace the memory module does not help, try removing the hard drive, DVD drive, modem, wireless card, keyboard. In other words, unload the laptop and only install minimal equipment and test again. If the laptop is still not on, the possibility of hardware damage to this laptop is the motherboard or processor. C. Hardware failure problem Laptop turns on and then turns off again. The laptop turns on without showing any images on the screen. After a few seconds, the laptop will turn itself off. Then it turns on and turns off again. This continues to happen until our laptop turns off completely. Most likely laptop hardware damage is due to several types of motherboard failure. You can try to reset/replace memory as I explained in problem B. If it doesn't help, it means the motherboard is damaged. 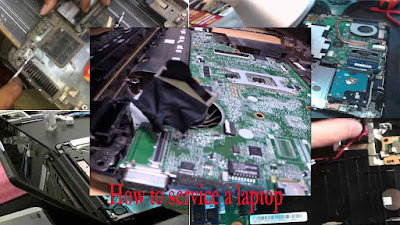 In most cases, it's very difficult to replace the motherboard, it's better to buy a new laptop. D. Hardware failure problems Laptops are very noisy. The laptop turns on and everything works fine, he makes some oddities, noise, and crackling. Some laptops make sounds all the time, other laptops are only intermittent. In most cases, this noise comes from a cooling fan or laptop hard drive. You can activate the laptop, wait until the sound appears again and after that listen carefully to the bottom of the laptop. If the laptop makes noise when the cooling fan starts running, it is most likely damaged. Replace the cooling fan. If the laptop makes a sound even when the fan is not spinning, maybe the laptop's hardware damage comes from the hard drive. Backing up all personal data from the hard drive as soon as possible, total damage can occur at any time. Reinstall the hard drive. Here are other techniques to find out whether noise comes from a fan or hard drive. Remove the hard drive from the laptop and start the laptop. Wait until it's warm and the fan starts spinning. If the laptop still makes the same sound even when the hard drive is removed, chances are the fan is damaged. E. Troubleshoot laptop hardware failure or stop when in use. The laptop turns on and runs correctly, but after a while, it immediately hangs or dies without any warning. When that happens, the laptop feels hot at the bottom. Also, the cooling fan works harder than usual. Most likely this laptop hardware damage is a processor heat problem. This happens because the cooling module is clogged with dust and the laptop cannot "breathe" properly. The laptop is turned off or stalled because the processor (CPU) is too hot. Clean the cooling fan and heatsink to correct the problem. F. Problems with hardware failure Laptop batteries are not charged. The laptop battery is not properly charged. There are two possibilities; not at all or after you adjust the position of the AC adapter connector in the power connector on the laptop. Battery damage. If the battery is completely not filled at all, try using the battery first. If it doesn't help, remove the battery and try running the laptop only from the AC adapter. If the laptop runs properly from the AC adapter but does not charge the battery at all, chances are the battery is damaged or the motherboard has problems. Remove the DC power connector. If battery charging stops after you set the position of the AC adapter in the connector, it means the DC jack has a problem. G. The hardware damage problem The screen gets dark while the laptop is running. The laptop starts correctly, but after a while, the screen lights off. Images still appear on the screen but are very dark. In some cases, the display lights never start but you can still see very faint images on the screen. In all laptop video cases, it seems fine if using an external monitor or TV. Most likely this laptop hardware damage is either a screen inverter or backlight display (CCFL). Both if damaged are very similar and cause the screen light to dim. For troubleshoot type of failure effectively, you need several parts: either a new working inverter or a backlight lamp that is still well known. H. Hardware Damage Problems Laptops Have Strange Or Fucked Pictures On The Screen. The laptop turns on correctly but on the screen shows a bad or chaotic picture. Graphics Card Failure. First of all, test your laptop with an output image on an external monitor. If you see the same problem on an external screen, chances are this is a graphics card failure. If the problem only appears on the laptop screen, damage to laptop hardware can be associated with one of the following: a bad connection between the video cable and the motherboard or the LCD screen or video cable fails or the LCD screen fails. I. Hardware Damage Problems Some Laptop Keyboard Keys Stop Working. The laptop turns on and runs well but some keyboard keys don't work at all or the characters are typed wrong. Most likely some keyboard keys failed. The laptop keyboard cannot be repaired. If several buttons stop working, you must replace the keyboard. J. Hardware Damage Problems The Laptop Keyboard Button Is Missing Or Damaged. A button is missing from the laptop keyboard. If the key is missing from the keyboard, it is still possible to repair it without replacing the entire keyboard. Hopefully, you don't damage the button hinges. If you have a lot of buttons missing, it might make sense to replace the entire keyboard. K. Troubleshooting Laptop hardware Makes Repeated Beep Sounds on Startup. You turn on the laptop but there is no video on the screen. Instead, the laptop makes repeated beeping sounds. The laptop will run normally when pressing one on the keyboard button. Most likely it happened because there was a button stuck on the keyboard. In this case, you must replace the keyboard. L. Hardware Damage Problems Liquid spilled on the laptop. You spill something on your laptop and the laptop stops working. Very dangerous and unexpected liquid spills. If that happens, turn off the laptop, remove the battery and do not use it until all internal parts are checked from liquid damage.